An extremely high quality, durable and slim case for your tablet or laptop 9" or 10". I have used Wenger products for over a decade and my cases still look and perform as new. What a bargain! Two pockets on the outside with solid zip closures. 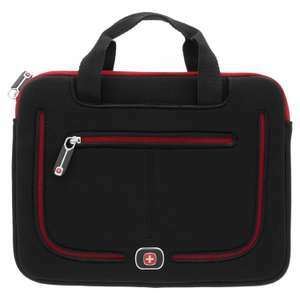 One padded inner compartment and another pocket area for documents or manuals. Bargain. but just had two of these delivered last week. Is this a cheap neoprene version? Can't argue for that price. Wenger stuff is well made too.